NASA has a new social media campaign to gear up its audience for Earth Day, an annual event to celebrate our planet – and the importance of protecting the environment – on April 22. SpaceX has pushed back the launch of its next robotic resupply mission to the International Space Station by four days, to April 30. Senate Armed Services Committee Chairman Sen. James Inhofe (R-Okla.) said the hearing was an "opportunity to continue to gather facts and to fully explore the proposal." 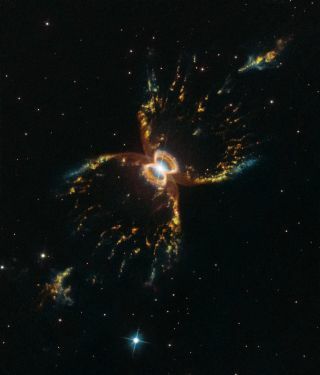 On April 18, the European Space Agency released an image featuring the hourglass-shaped Southern Crab Nebula to celebrate the Hubble Space Telescope's birthday coming up next week. A slower, thoughtful episode beautifully observes and parodies human behavior in "The Orville" season's penultimate episode. Cosmic Crustacean Makes Great Birthday Card for Hubble's 29th Year (Image) And many more! Tickets on Sale for 'Deep Space Nine' Documentary 'What We Left Behind' In theaters in the Gamma Quadrant for one night only. SpaceX's Next Space Station Cargo Launch Delayed to April 30 NASA officials attributed the delay to constraints imposed by the ISS and orbital mechanics. The next space station crew will discuss their upcoming mission today at 2 p.m. EDT (1800 GMT). Watch it live here. On April 19, 1971, the Soviet Union launched the world's first space station, Salyut 1. See how it happened in our On This Day in Space videos series!